Is Partial Knee Replacement Surgery Better Than Total Knee Replacement Surgery? An estimated 100 million American suffer from some type of chronic pain, and of them, knee pain is the second most common cause. Joint replacement surgery is often recommended for those who are unable to perform everyday tasks, such as sleeping, without difficulty and pain. According to the Agency for Healthcare Research and Quality, more than 600,000 knee replacements are performed each year in the United States. But, in some cases, you may only need a partial knee replacement versus a total replacement. Here’s how doctors determine which method is best for you. 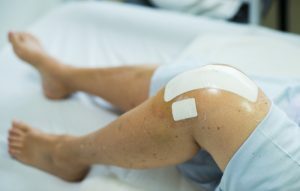 While there is some information that supports partial knee replacements are better than total knee replacements, which one is better largely depends on your individual circumstances. There is simply no one-size-fits-all solutions when it comes to identifying and treating chronic joint pain. For some, non-surgical treatment methods or minimally-invasive procedures may be most effective. You should always consult a physician who specializes in orthopedics to help you determine if knee replacement surgery is best for you, and whether to pursue partial knee replacement or total. Keep in mind that while orthopedics is a specialty in itself, orthopedic doctors often further specialize in different areas of the body. Seek out a physician that is experienced in treating the knee joint and stays up-to-date with the latest treatment methods. The location of your knee injury is a major factor in whether a partial or total knee replacement is better. The knee is one of the largest and most complex joints of the body. It’s made of four main components–bones, tendons, ligaments, and cartilage–which are supported by surrounding muscles. If the damage to your knee is located in either the medial compartment or the lateral compartment, you may be a good candidate for a partial knee replacement surgery. However, if you are experiencing pain throughout your entire knee or in the front of the knee under the kneecap, then a total knee replacement is likely best. Other factors your physician will consider include your age, severity of symptoms, medical history, and overall health. South Shore Orthopedics offers a variety of joint replacement services including total knee replacement and partial knee replacement. If you are ready to say goodbye to joint pain once and for all, call 781-337-5555 to schedule an appointment today or request an appointment online.